This stunning, custom made, one of a kind haute couture gown was designed and made by Steven Khalil. The gown is made of three layers. The first layer is a beautiful full French Chantilly lace, the second a soft weightless tulle overlay, with a final layer of Steven’s gorgeous signature thick 3D hand-beaded lace encrusted with crystals and hand-sewn pearls. Steven’s lace is truly unique and show-stopping. This gown is figure-hugging and fully boned in the bodice and features a low back with glamorous hand-sewn pearl straps. The bottom layer is a ‘natural bone’ colour (ie. it’s not see through at all), the train is approximately 1.5m in length and also has a button hook so that it can be bustled up for dancing. There is padding in the bust which can be taken out, I am a size C-D cup. I am a standard size 10, 167cm tall and wore 10cm heels on the day. 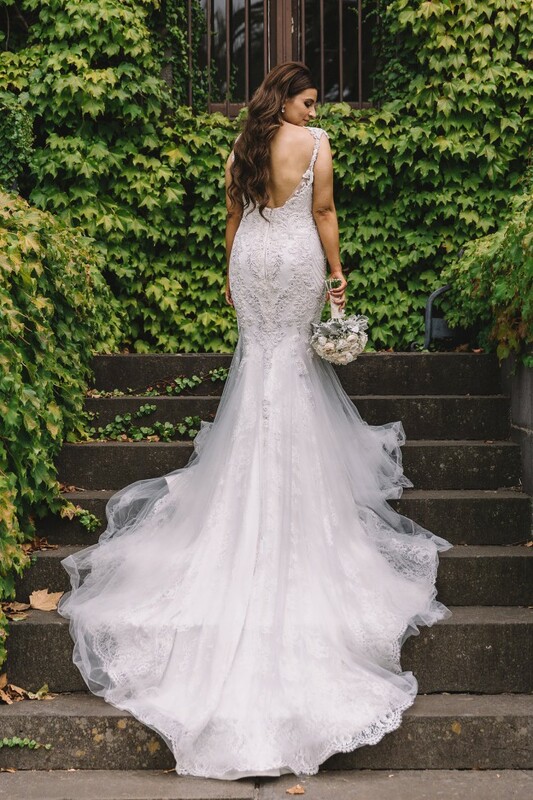 This gown is in excellent condition and has been professionally hand dry-cleaned at Syndal’s Bridal Dry Cleaners (The best in Australia - taking 6 weeks for this service, worth $720. Certificate can be provided. The gown also comes with Steven Khalil's preservation dress bag. Please note the veil is not included.